Filtering controls the aggressiveness of the minimum response filter in protecting Rater anonymity. The minimum response filter allows you to determine how many responses must exist for each relationship group for the responses to be included in the report. 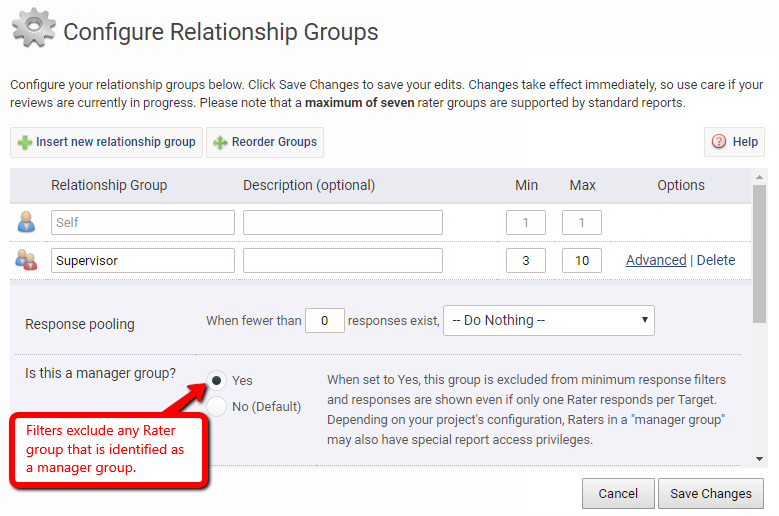 Filters always exclude "Self" and any Rater group that is identified as a “Manager Group.” This setting is ignored in reports with rank scores (percentiles and quartiles). Choose the Minimum Responses Per Rater Group in the dropdown box. Select the Minimum Response Filter Intensity in the dropdown box. There are three setting options available, High, Medium, and Low – descriptions of each option are found next to the filter options. You may also turn ON the filter for each individual report by following the step-by-step instructions below. Select PDF Report next to the Target’s name you want to generate the report for. 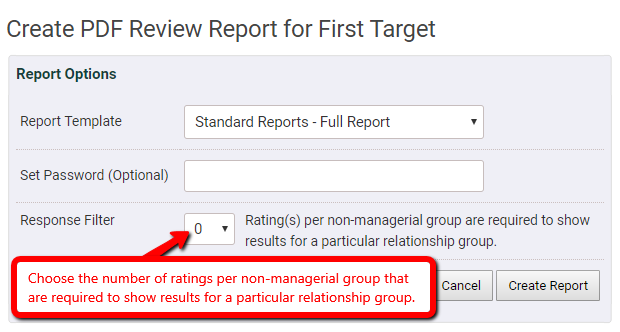 Choose the number of ratings per non-managerial group that are required to show results for a particular relationship group next to Response Filter.